Upper River: Cooler weather has halted the melt and the river is clear and stable. BWO's are the main menu item right now, but caddis larva and pupa are becoming increasingly available and important. In the afternoons, be prepared for BWO hatches; we've had excellent reports on the river above Buena Vista. Nymphing slow, consistent pools and runs early and mid-day in the upper basin can be productive, with fish moving into faster riffles to feed when nymphs are drifting, primarily in the afternoons. Be thorough in your approach, and adjust your weight and depth accordingly. Middle River: Last week saw our first caddis emergence above Salida, and had insects active up to Big Bend. Anglers should see opportunities to fish dry flies over the next few days, and pupa and larva patterns are extremely effective both on a dead drift and on a swing in anticipation of bugs on the water. BWO's are still very prevalent in this area (with hatches coming on cloudy days), so combinations of caddis and mayfly nymphs have been effective during non-hatch periods. Spring fishing is now underway up through Browns Canyon and the Milk Run. Daily nymphal drifts of BWO's, as well as some good cloudy day hatches, have energized the fish population and allowed them to disperse form winter water. Also, look for morning caddis larval drifts. With the significant decrease in flows, crossing the river at Hecla is now relatively easy and the wading through the Big Bend area is much easier. Cloudy weather this week should produce some excellent afternoon hatches, and yield great dry fly fishing scenarios. Lower River: There have been reliable reports of caddis activity up to the Big Bend area, both hatching insects and egg-laying adults, and any days of warm sunshine should bring more of the same, prompting hatches around the Salida area. The "hatch" is not a blanket occurrence like years ago; anglers are more likely to find pockets of intense activity scattered through the river corridor. We've had many reports of fish rising to take adult imitations in areas where caddis are in the air, even if there is not a hatch occurring in the moment. Prospecting with dry flies in the afternoon can be productive if you can cover water. Cloudy days will still yield BWO hatches, so stay prepared. We are also seeing good cranefly and midge activity. Flows are at a level that is conductive to both wade and float fishing. We are still swing consistent BWO nymphs drifting daily, and duns on the water on cloudy afternoons. Nymphing will still probably be your best bet throughout the day, but don't limit your strategy to deep water; shallow riffles can be productive in the afternoons once mayfly nymphs become more available. The recent water temperature has been about 56 degrees. Saugeye have been biting up around the rocky points of the main lake, mostly on small silver crankbaits and rattletraps. The crappie bite has been sporadic recently. The white bass and wiper bite has been decent around the stilling basin and spillway, and starting to pick up on the main reservoir. Anglers have had success using various lures and live baits. There have been a few reports of drum being caught on the main reservoir with flies and crankbaits. Anglers have continued to catch rainbows that have recently been stocked. Anglers have also been catching trout in the 10 to 18 inch range on various baits and lures. As the weather continues to warm, expect a stronger bite from warm-water species. The lake is at approximately 949 surface acres. Fishing from the south shore has been slow due to high water. Anglers that have been catching trout at the south shore have been using worms and PowerBait. Reilly Canyon, where the river comes in, has been slow due to the muddy water from recent rains. Anglers have been catching a few catfish and bass in the canyon. Boaters have been catching mostly trout and walleye. Perch have been caught from both shore and boat. Jigs tipped with worms have been the go-to. Fishing has been good for a variety of species. There is water being pumped into the lake and the level is rising with somewhat muddy conditions. 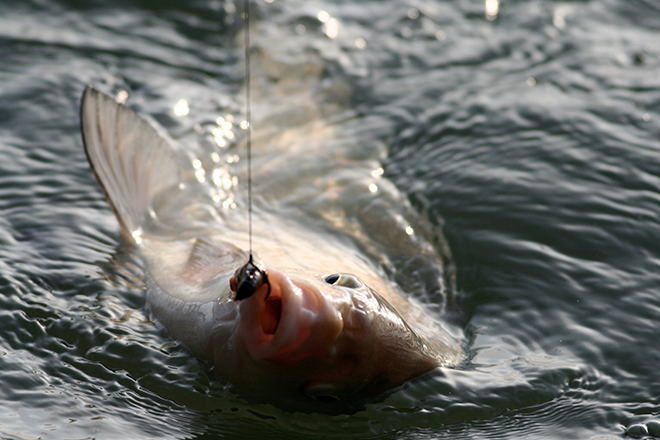 Fishing continues to be good for crappie, bullheads, channel catfish, and trout. There have been a few reports of wiper and saugeye as well. Anglers have had success catching trout using PowerBait and nightcrawlers. Crappie, wiper, and saugeye have been hitting on white twistertails. The boat ramp is currently usable for smaller boats. Just a reminder; gas motors are not allowed on this lake, so boats must be either electric, wind, or hand powered. The current water temperature is about 50 degrees, and will continue to rise with the approaching warm weather. The water is currently off-colored, with visibility down to about 12 to 18 inches. The water level is continuing to slowly drop, so watch for underwater hazards as the lake slowly recedes. The south boat ramp is currently useable. Bass, crappie, saugeye, catfish, and wiper are biting around the lake. Bass have been hitting on jigs and Texas rigged worms. Crappie, saugeye, and wiper are hitting on white and chartreuse twister tails on 1/8 to 1/4 oz jig heads. Catfish are hitting on worms and chicken livers.